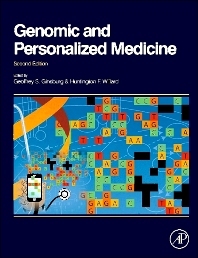 Genomic and Personalized Medicine, Second Edition — winner of a 2013 Highly Commended BMA Medical Book Award for Medicine — is a major discussion of the structure, history, and applications of the field, as it emerges from the campus and lab into clinical action. As with the first edition, leading experts review the development of the new science, the current opportunities for genome-based analysis in healthcare, and the potential of genomic medicine in future healthcare. The inclusion of the latest information on diagnostic testing, population screening, disease susceptability, and pharmacogenomics makes this work an ideal companion for the many stakeholders of genomic and personalized medicine. With advancing knowledge of the genome across and outside protein-coding regions of DNA, new comprehension of genomic variation and frequencies across populations, the elucidation of advanced strategic approaches to genomic study, and above all in the elaboration of next-generation sequencing, genomic medicine has begun to achieve the much-vaunted transformative health outcomes of the Human Genome Project, almost a decade after its official completion in April 2003. Specialists across medical disciplines, research professionals in human genetics/genomics, oncology, neuroscience, gene therapy, molecular medicine, and related areas. It will be indispensable to medical students and graduate students in genetics and biomedical sciences. Why Study Complex Disease in Populations? Will Personalized Genomic Risk Profiles Motivate PEOPLE to Adopt More Healthful Behaviors? When is Informed Consent Required? Why Genomic and Personalized Medicine in Epilepsy? Genomics in Epilepsy: What Do We Know? What are the Roles of Common Variants in ASD? Dr. Ginsburg is the founding Director of the Center for Applied Genomics & Precision Medicine in the Duke Institute for Genome Sciences & Policy. He is also Professor of Medicine and of Pathology at Duke University Medical Center, Professor of Biomedical Engineering at Duke Pratt School of Engineering, and Co-Director of the Duke Translational Medicine Institute. Huntington Willard is on the faculty of the Department of Human Genetics at the University of Chicago. Prior to this appointment, Willard was the President and Director of the Marine Biological Laboratory and Professor of Human Genetics at the University of Chicago. He was previously on the faculty at Duke University, where he was founding director of the university-wide Duke Institute for Genome Sciences & Policy from 2003 to 2014, the Nanaline H. Duke Professor of Genome Sciences, and the Arts & Sciences Professor of Biology & Genome Sciences.